The Morrison Shelter was introduced in 1941 after it was decided that the corrugated Anderson shelter was not suitable for indoor use. Although named after politician Herbert Morrison the shelter was actually designed by a dentist, Alfred Moss, the father of Sir Stirling Moss, one of Britain’s greatest ever racing drivers. 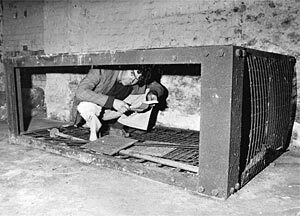 The shelter was built in the form of a table which could be used by the family when a raid was not in progress. It stood on steel legs two feet, six inches high, and was topped with a sheet of steel measuring six feet by four. When the siren went the family took cover underneath and fitted mesh side pieces to give themselves all round protection. Morrison shelters proved to be extremely strong and frequently the occupants were found safe and sound despite their house being destroyed around them. It was reported that a house in Roseland Avenue was totally destroyed by a high explosive bomb but six people in the Morrison on the ground floor were rescued unhurt, while a house in Monks Road was hit and the Morrison blown over a brick built communal shelter in the street before landing in a bedroom of a house on the opposite side of the road virtually intact. The occupants, a woman and two children, were not quite so fortunate this time as the woman and one of the children needed hospital treatment. Sadly it’s injuries later proved fatal, but the other child happily escaped uninjured. What to do with 6000 shelters? Prior to the Exeter Blitz in May 1942 the number of Morrison shelters issued in the city totalled 5918, but once the war was over these life savers became so much scrap. Many were salvaged by Exwick business man Bill Eastmond who was to become a director of the Exeter Falcons speedway team. When speedway returned to the County Ground in 1947 building supplies were in very short supply and materials to build a new safety fence around the track were unattainable. Mr Eastmond soon came to the rescue and built the fence using the top panels of 242 Morrison shelters attached to wooden posts obtained from air raid salvage dumps. At first there was opposition to the construction of this fence mainly from the governing body, the Auto Cycle Union, but these concerns were overcome in time for the opening meeting in April 1947. It was not however unique as the idea was later copied at Poole, Ipswich and Halifax. Over the years many visiting riders feared what they considered was an unforgiving fence. It certainly was if you hit it, and plenty of riders still carry the scars to prove it. 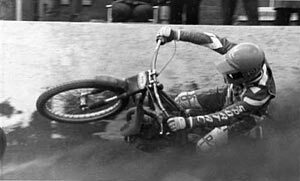 This gave the Falcons considerable home advantage as the likes of Len Silver, Ivan Mauger, and Vaclav Verner frequently gained extra drive off the bends by running with their back wheel up against the steel panels. In fact pioneer Falcon Sid’ Hap’ Hazzard was offered an extra fiver in his pay packet if he got his wheel up again the fence. Sid replied ”Make it a tenner and I’ll get both wheels up”. Ten pounds was a fortune in 1947 and Sid fulfilled his promise. The old steel safety fence lasted until the stadium was demolished in 2006. Before that happened a small band of Falcons supporters were given permission to remove five panels, one of which is destined for the National Speedway Museum at Hoddesdon. Even then the fence claimed one last victim. Long time track official John Tombs was cutting off retaining bolts with a cold chisel when it slipped and badly cut his thumb! Tony Lethbridge has lived in Exeter all his life, and his family ran a butchers shop in Cowick Street for many years. Tony is the city's foremost expert on the Exeter Falcons and has written several books about them. A Morrison Shelter. Photo Express and Echo. Andy Sell rides the Morrison shelter barrier at the County Ground. Photo Mark Tregale. 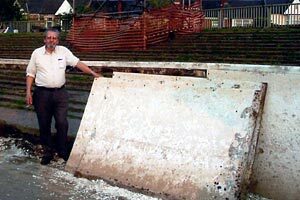 John Tombs by the Morrison shelter barrier when it was being removed in 2006. Photo Tony Lethbridge.